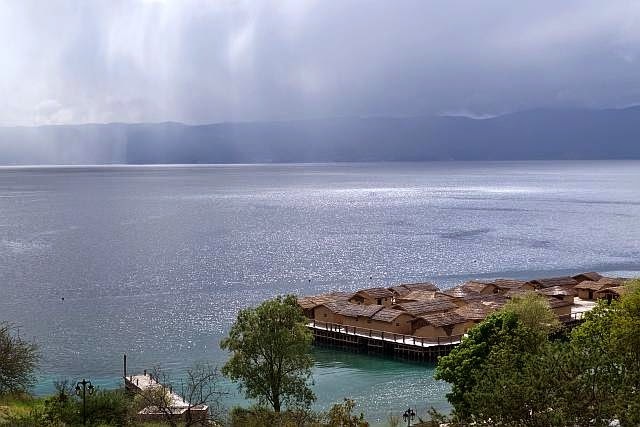 Ohrid is one of Macedonia's (or Former Yugoslav Republic of Macedonia) top tourist attractions, as evident from the crowds in the old town square and the lakeside. In fact, the number of tour groups I see there were more than Skopje's main square. 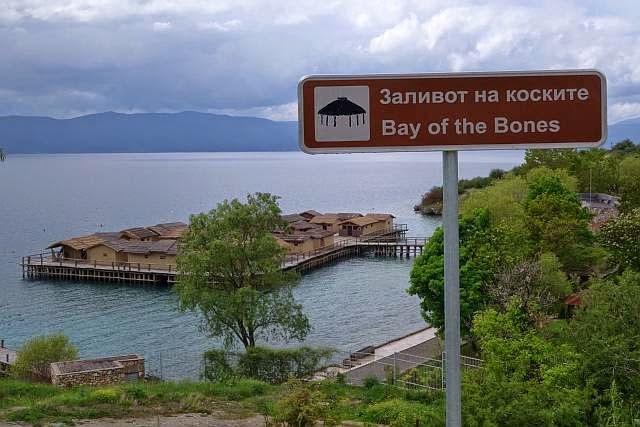 And further 10km away from Ohrid, near the village of Pestani, is an interesting attraction worth going out for. Situated on the Gulf of Bones (or Bay of Bones) is the Museum on Water - an archaeological complex that is one of its kind. When I think of the term 'prehistoric settlement', something land-based would come to mind. 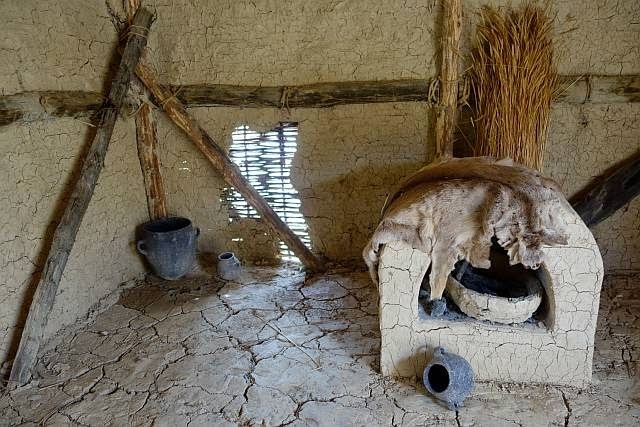 However, the Museum of Water is a partial reconstructed prehistoric settlement on water, dating as far back as 1200BC. 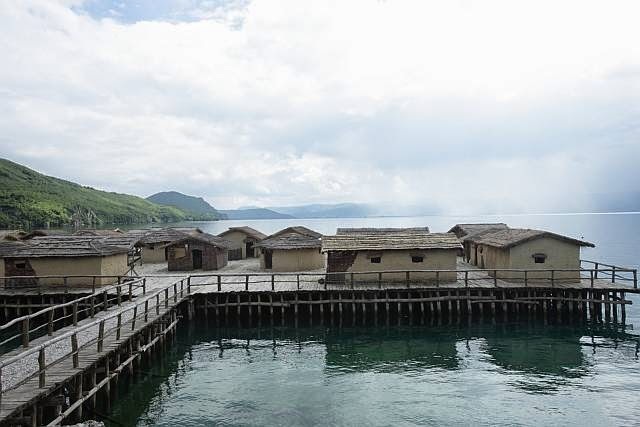 The restored houses sit on a platform on stilts 5 metres above the lake, and within these houses, artifacts salvaged from underwater excavations in the area are exhibited. These include stone tools, bones of animals and deer horns etc. Thus the museum is the whole settlement itself, and it's a really nice walk around the museum/houses and browsing through the interiors of the houses and their "possible setup". A Roman military fort (Gradiste) had also been reconstructed on the hill overlooking the Bay of Bones and can be accessed with the same entrance ticket. Compared to the Museum on Water though, the fort seemed woefully "uninteresting". 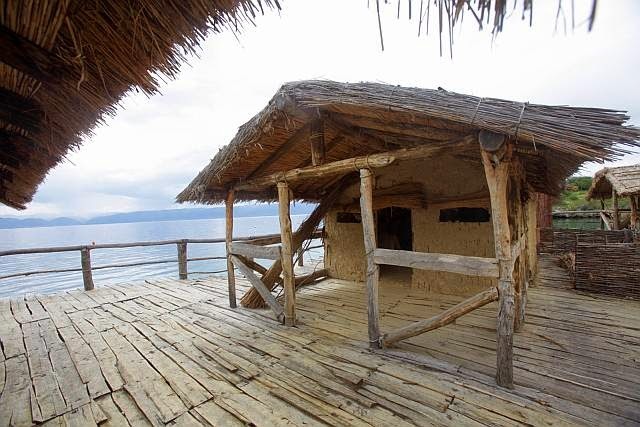 For those who have a little bit more time, consider staying in Pestani, a village on the eastern shore of Lake Ohrid. 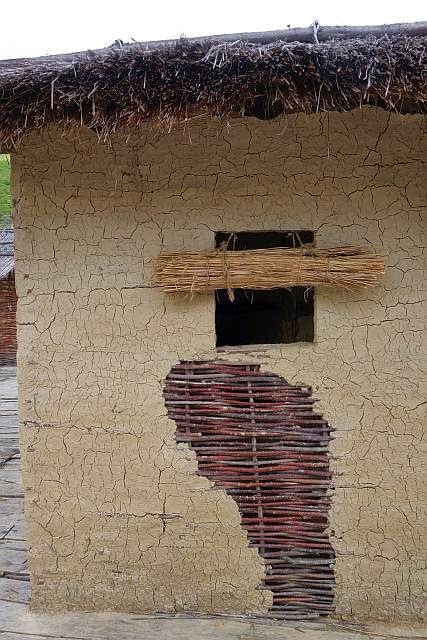 The museum is just 2+km from the village of Pestani, and can be easily reached by walking. Pestani is also a launchpad to hikes to Galičica National Park, and makes an excellent 'getaway' from the touristy crowds of Ohrid. Unfortunately, I couldn't go to any of the hikes due to a spell of bad rainy weather in the area. During low season though, you could get a private ensuite room for the same price as a dorm bed in Ohrid - about 10 euros!! And alot of the accomodations are on the lakefront! Minivans and shared taxis ply the route between Ohrid and Pestani, and its only a 20+min ride. Cost is the same for both at about 30 denars. Check it out!